Everett - Corporate Jet Charters, Inc.
Everett is the county seat of Snohomish County, Washington, and it lies 25 miles north of Seattle. The city is known for the production of Boeing airliners and nearby is the largest building in the world, used by Boeing for commercial jet aviation production. Surrounded by nearly 50 miles of freshwater and saltwater shores, Everett is exploding in the arts scene with top-notch galleries and a state-of-the-art glass blowing studio. The city also allows for easy access to Seattle for business while maintaining the outdoor charm that Washington state is known for. 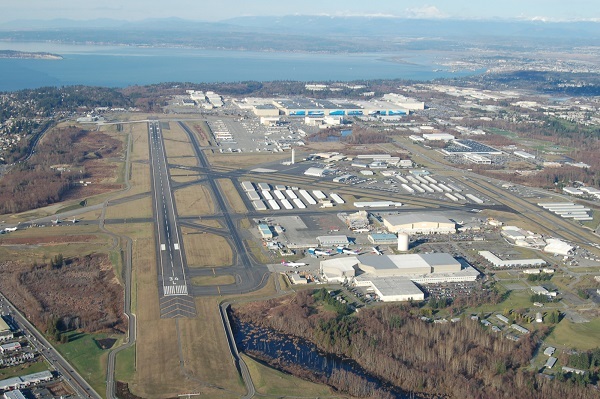 Paine Field, also known as Snohomish County Airport is a public airport located near Everett, Washington. The Airport is home to the Boeing manufacturing plant for 747, 767, 777, and 787 aircraft, and has become a major tourist destination with the opening of the new Future of Flight Aviation Center & Boeing Tour, the Flying Heritage Collection and the Historic Flight Foundation. This airport is a popular alternative to Boeing Field in Seattle, and allows business travelers to access the area much easier. This airport features three runways with the longest being nine thousand and ten feet.